The Harold Porter NBG: Western Section, cultivated garden is home to the concert area, the marquee lawn, summer-flowering plants and ponds. 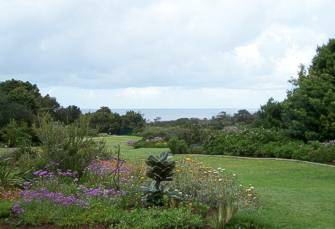 The best views of the sea can be seen from this side of the garden, without climbing some way up the mountain. The wide stretch of lawn of the concert area slopes down to the stage area situated near the river. It is a wonderful spot for young children to let off steam and a favourite pastime is to roll down the slope! During the summer, festive season concerts and carols by candle light take place here. A secluded area in the centre of the Garden, the Marquee Lawn, is surrounded by trees, making it the perfect outdoor venue for private functions. It is big enough to house a marquee tent should one be wary of the likelihood of inclement weather. It can also be used as an open air ‘chapel’ for nature lovers’ weddings. Several of the beds in this area are being developed to display plants which flower in summer when the Garden is at its busiest.